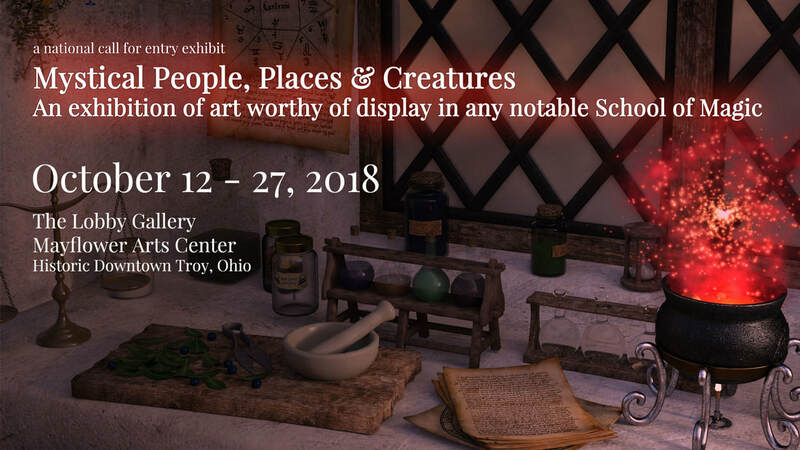 Mystical People, Places & Creatures is a call for entry for fan art worthy of being displayed proudly on the walls of any notable School of Magic! 2D and 3D artwork by artists of all ages and of all media is welcome. The exhibit will be on display in the Mayflower Arts Center’s Lobby Gallery during the month of October. The Mayflower Arts Center seeks 2D and 3D artwork of any medium (excluding audio and video) submissions to the upcoming Mystical People, Places & Creatures exhibition. The jury will select images to be displayed in the exhibit based on the following criteria: adherence to the theme, technical expertise, and originality. All 2D and 3D artwork meeting the theme of the exhibited (no audio or video files will be accepted). All works must be delivered ready to install. Any work not properly prepared will not be included in the exhibit. All artwork must either be for sale or marked NFS (Not For Sale). The Mayflower Arts Center receives a 30% commission on all sold artwork. Exhibiting artists will be required to deliver artwork to the Mayflower Arts Center by no later than October 5 at 5pm. Work shipped must include return postage. No packing peanuts please. Any artwork received after 5pm on October 5 may not be included in the exhibit. ​By submitting artwork to Mystical People, Places & Creatures you grant the Mayflower Arts Center the right to use and publish images of your artwork for promotional purposes. Artist retains all other rights to the artwork. *Gallery Hours are Tuesday - Thursday 10:00-4:00pm, Friday - Saturday 10:00-6:00pm. Tag and follow the Mystical People, Places & Creatures Exhibition on social media using #mysticalartexhibit. Follow the “Mayflower Arts Center” on Facebook, @MayflowerArtsCenter on Instagram, and @MayflowerArts on Twitter.